"Wally has a great understanding of the golf swing and is able to relate this to young and old alike. His wit and enthusiasm make it a joy to learn all aspects of the game of golf." "Wally's tapes and the methods they teach are unlike any golf videos you have ever seen. Wally's "Maximize Your Game" tape series sets the standard by which all other golf videos will be measured." “After watching your DVDs and practicing with the CB Ball, I shot a 77. finally breaking 80! Wally, you’ve made me a believer! "I never thought it could be this easy. I just Swing the Circle and the ball takes off right where I’m aiming every time! I love Wally’s method, it’s genius." "Your dvd and training aids were like a ray of sunshine blasting through a cloudy day. Suddenly, this game began to make sense. You gave me the big picture and a true feel for the correct swing. The Circle Building Ball is an amazing tool." 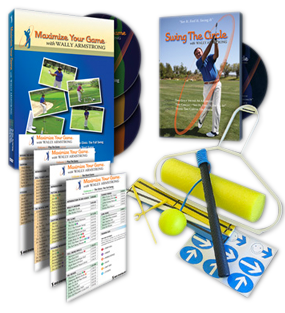 "You’ve taken the guesswork out of feeling the correct inside out power swing. "My SLICE IS GONE, I’ve lowered my scores by 15 shots and I’m hitting my drives 30-40 yards longer using your Swing the Circle technique – it’s amazing! Thanks Wally"